Yesterday, the Rajya Sabha adjourned sine die without transacting any legislative business on the last day of Budget Session. 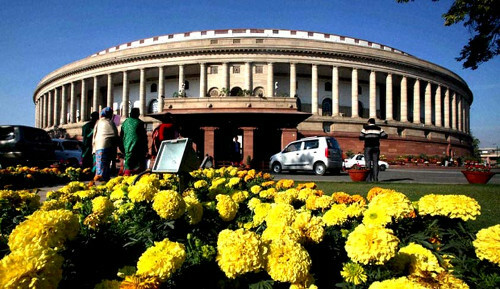 The term of the present 16th Lok Sabha is till June 3, before which it will be dissolved for general elections. Since there will be no further Parliamentary sessions before elections, yesterday's adjournment of Rajya Sabha will lead to the lapse of several important bills which were pending there after being cleared by the lower house. A Bill which is pending in the Rajya Sabha, after being passed by the Lok Sabha, will lapse on the dissolution of Lok Sabha. But if the Bill was introduced in the Rajya Sabha, the dissolution of Lok Sabha will not lead to its lapse(Article 107, Constitution of India). The contentious Muslim Women(Protection of Rights on Marriage) Bill - commonly known Triple Talaq Bill- was passed by the Lok Sabha on December 27, 2018. The Bill, which makes pronouncement of triple talaq an offence, has faced tough opposition in the Rajya Sabha. Opposition members voiced the apprehension that the Bill, if passed, could lead to persecution of Muslims and demanded scrutiny by a select committee. They also questioned the logic behind criminalising an act, which is mostly civil in nature, and which has been held to be void by Supreme Court. Yet another contentious Bill, the Citizenship(Amendment) Bill, was passed by the Lok Sabha on January 8. The Bill makes it easy for non-Muslim migrants from Pakistan, Bangladesh and Afghanisthan who entered India before December 31, 2014, to acquire Indian citizenship, by relaxing several conditions under the Citizenship Act. The main criticism against the Bill is that it links citizenship with religion and discriminates migrants on basis of religious identity. Also, the north-eastern states have been witnessing intense protests against the Bill. According to the protesters, the Bill legitimises several illegal immigrants, which will disrupt local demographics. The Aadhaar and Other Laws (Amendment) Bill was tabled by the Government in Lok Sabha with the purported intent of making the Aadhaar Act compatible with the September 26 judgment of the Supreme Court. Passed by the Lok Sabha on Janaury 4 with little debate, it amends the Aadhaar Act 2016 to permit the enrolment of children to the scheme with the consent of their parents or guardian. It also contains a provision enabling the children to seek cancellation of their Aadhaar number on attaining majority. It also amends the provisions of Telegraph Act and Prevention of Money Laundering Act to permit voluntary use of Aadhaar for authentication of identity while obtaining mobile connections and opening bank accounts. Several experts have slammed the Bill over privacy concerns. The DNA Technology(Use and Application) Regulation Bill, permitting regulated use of DNA for establishing the identity of persons in criminal investigations and specified civil matters, was passed by the Lok Sabha on January 9. Privacy concerns were raised in respect of DNA Bill as well. The Transgender(Protection of Rights) Bill, which seeks to define transgenders and prohibit discrimination against them, was passed by the Lok Sabha on December 18. Several members objected to the requirement imposed by the Bill to get a certificate of gender identity from District Magistrate. This requirement was termed invasive and violative of personal dignity. The transgender community has expressed unhappiness over the Bill. On December 20, the Lok Sabha passed the the Consumer Protection Bill, which seeks to wholly replace the Consumer Protection Act 1986. The Bill seeks to establish a national level regulator -Central Consumer Protection Authority- to deal with consumer complaints on a proactive measure. The Surrogacy(Regulation Bill) passed by the Lok Sabha on December 20 prohibits commercial surrogacy, and introduces regulations for surrogacy clinics. The Motor Vehicles(Amendment Bill), which was passed by the Lok Sabha in April 2017, faced tough opposition in Rajya Sabha during last year's Monsoon Session. Several opposition members criticised the Bill on the ground that it took away the powers of States in respect of grant of transport permits and licenses. It was also expressed that the Bill does not adequately address concerns of road safety. The Bill could not be passed over several issues flagged by the opposition in Rajya Sabha.